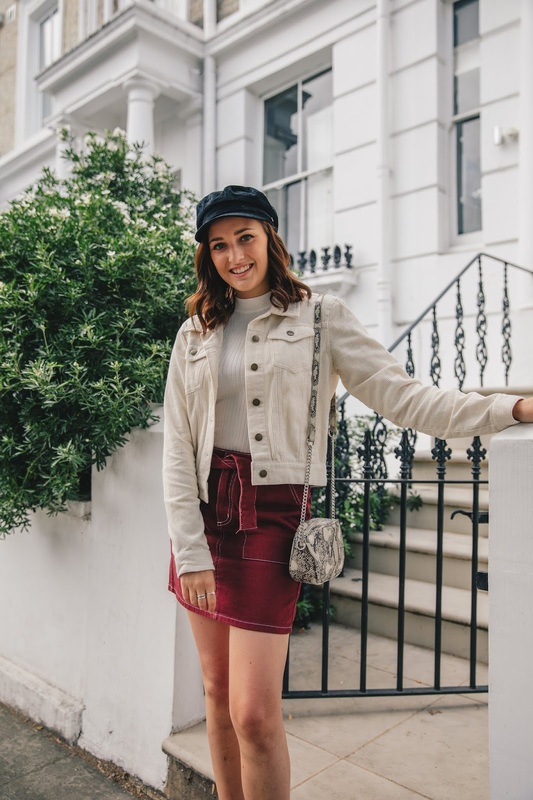 2 Looks To Try This Autumn! 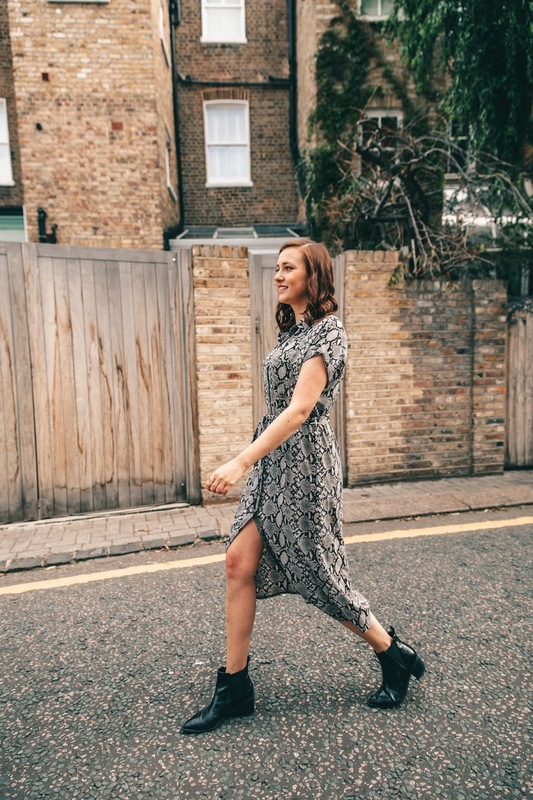 I cannot believe it has been almost a month since my last blog post. Since then I have been on an amazing holiday to Canada for two weeks with my boyfriend and family. We had such an incredible time with lots of happy memories and it was just so lovely to have a proper break from work and spend quality time with my family. I was also away last weekend with my boyfriend and his family to a spa resort in the English countryside, which was very beautiful and super relaxing. I have been back in London and back to work for over a week now and I am slowly starting to get back into a routine after being off for so long. It has been a busy month and it has absolutely flown by! I am currently wishing there were more hours in the day and more days in the week to allow me to juggle everything in my life but alas I can only do what I can. 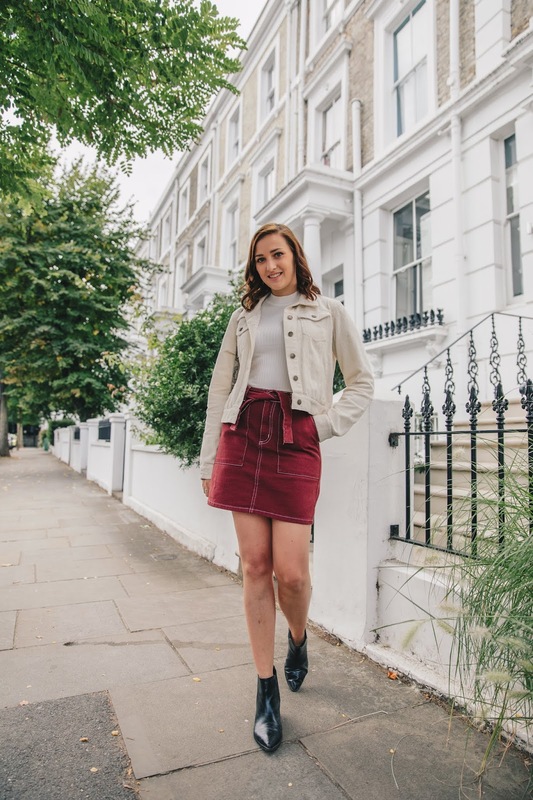 I would absolutely love to be posting on my blog multiple times a week, but it is simply not possible for me, since I work full time and have so much going on. For now, I will try to stick to one post a week, which is definitely a more achievable goal for me. 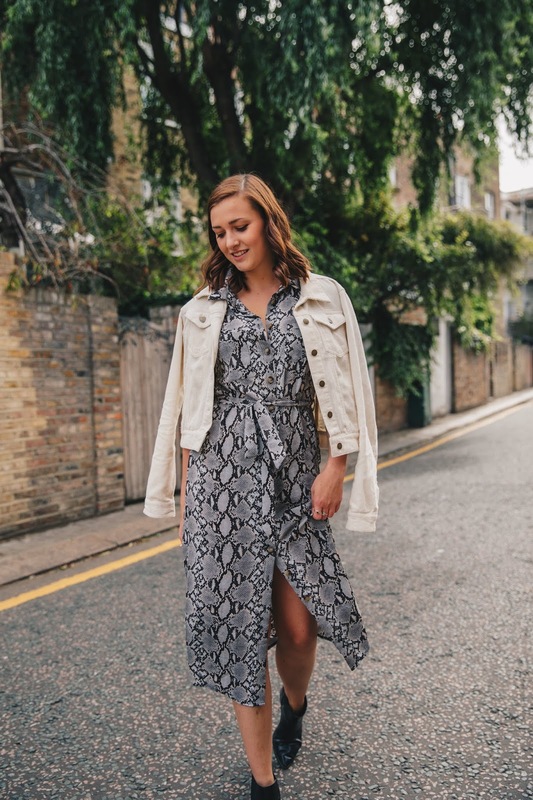 I am honestly so excited to be back posting on my blog and to share some new outfits that I shot with the talented Sarah in Holland Park recently. Autumn has finally arrived and I for one am thrilled - it is my favourite season. Not only because of the change in weather or the fact pumpkin spice latte season has begun, but it is my favourite season for fashion. 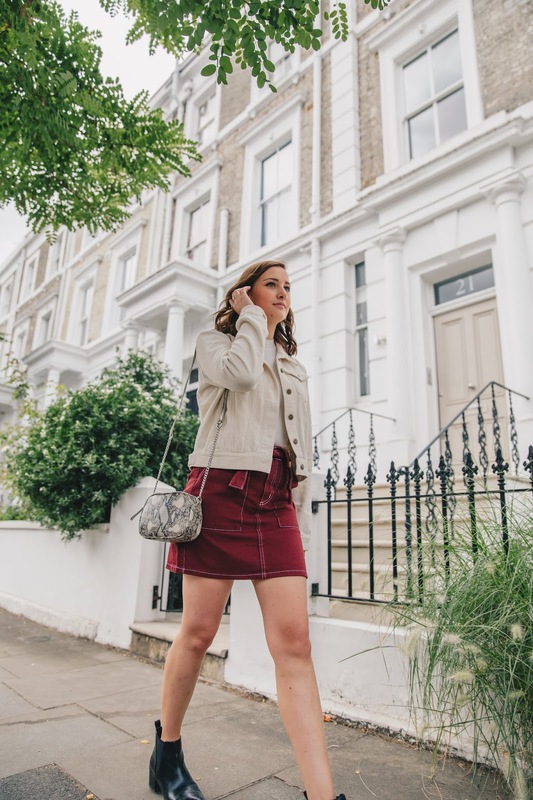 I am loving the change in colour palette, being able to layer pieces again and get my knitwear and coat collection back out for the colder months ahead. 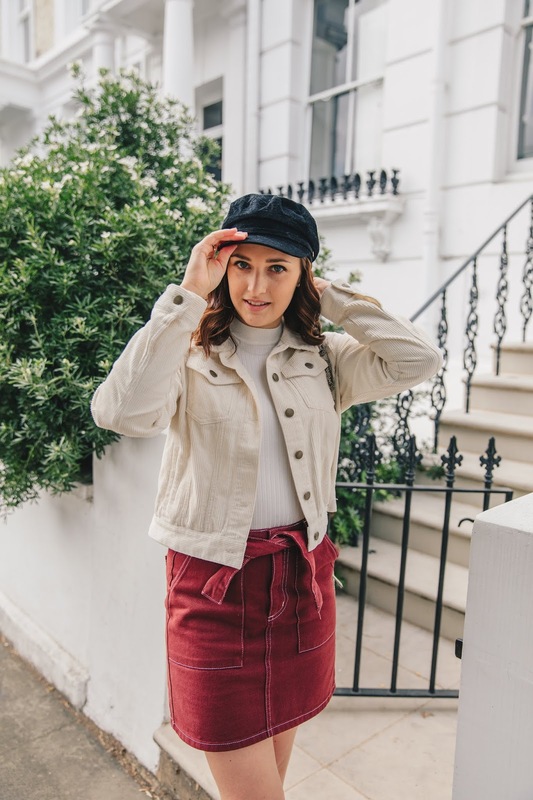 I have put together two affordable looks for Autumn in this post, tapping into a few key trends that are around at the moment. I hope you like them! 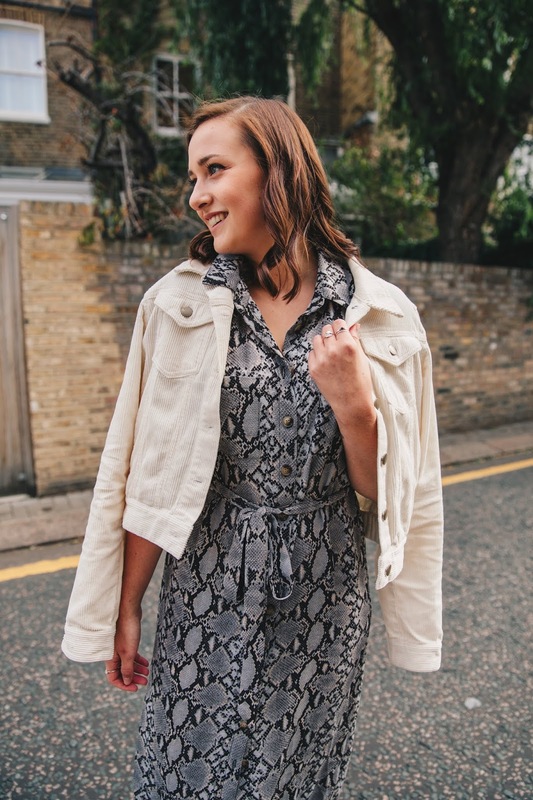 Snakeskin has truly become the trend of the moment. It is everywhere. I spotted this dress in New Look recently and loved it. 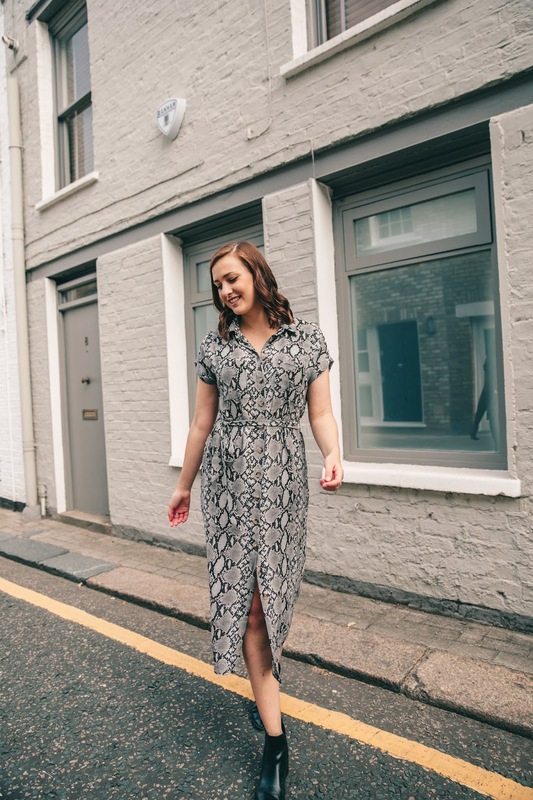 Although snake skin is quite a daring print, the monochrome colours and simple dress shape make this piece so wearable and it has become a firm wardrobe favourite for me right now. I have been wearing it to work, out for drinks with friends and to dinner with my boyfriend. It is so versatile and works as the best desk to dinner outfit. I can't tell you how good it feels to be wearing ankle boots again. 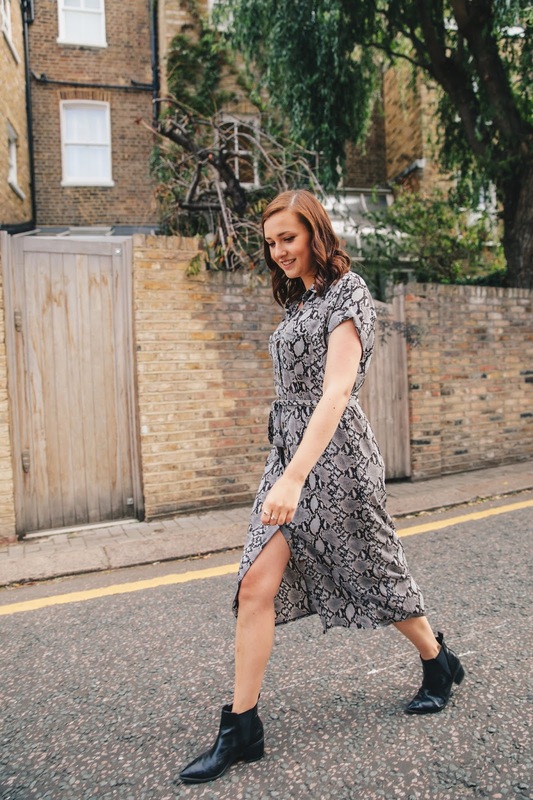 These Forever 21 pointed boots are actually from last winter but I still love them as much as ever and they go just perfect with this dress. 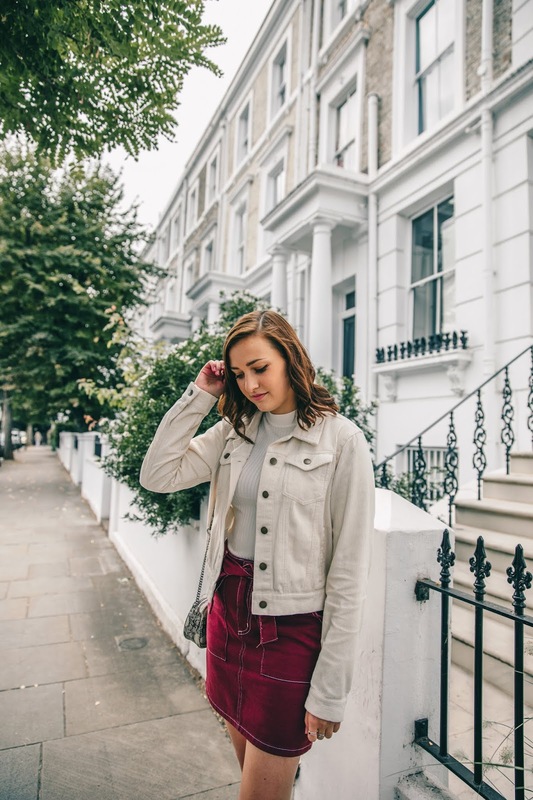 My little chuck on jacket is also from Forever 21 and I just had to add it to my wardrobe after featuring it in my recent Autumn wishlist blog post - you can have a read here if you are looking for some more Autumn style inspiration. I loved putting this outfit together. It is so nice to start layering pieces again, it really got me excited about autumn style. 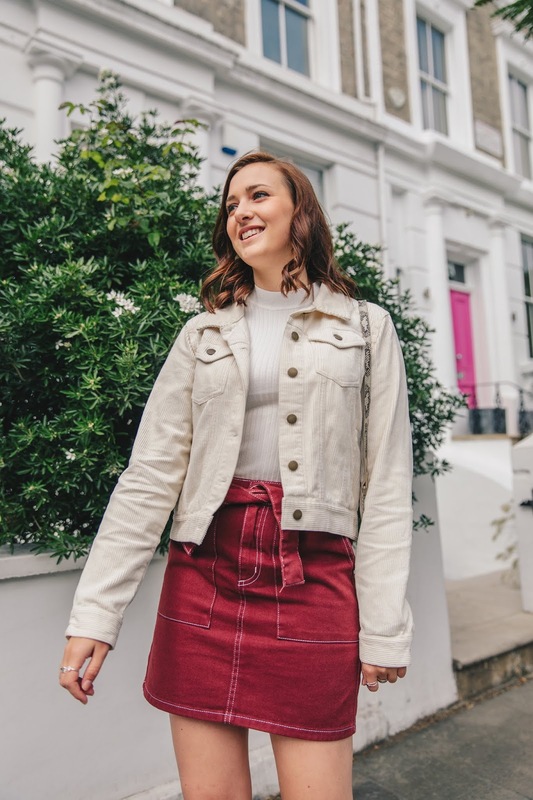 This New Look skirt is such a gorgeous rust shade which has become a bit of a key colour for this winter. 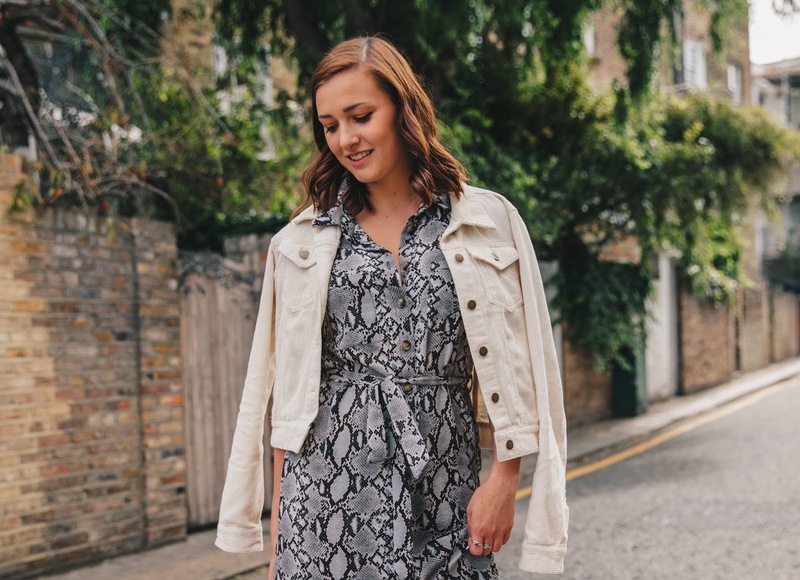 It is a very flattering style and is a great addition to my wardrobe for the season ahead. I am sure I will start mix and matching it with some chunky knitwear very soon! 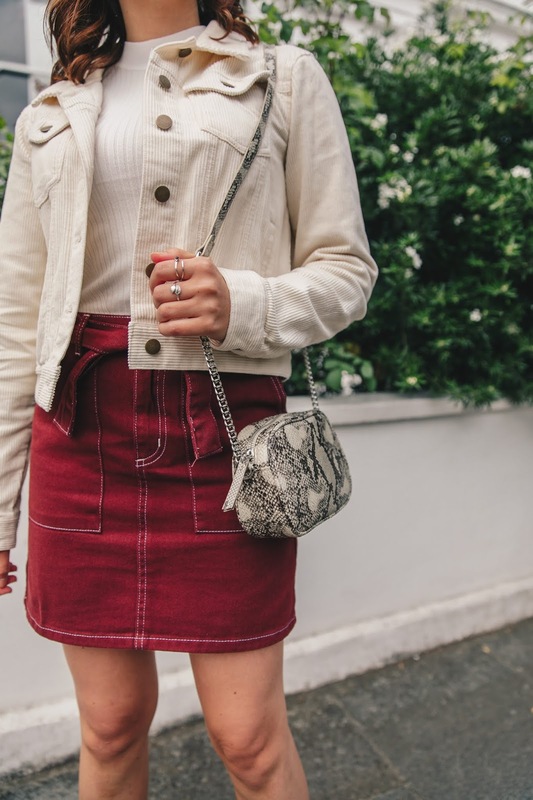 I paired the skirt with a white high neck top and again wearing my little white crop corduroy jacket from Forever 21. 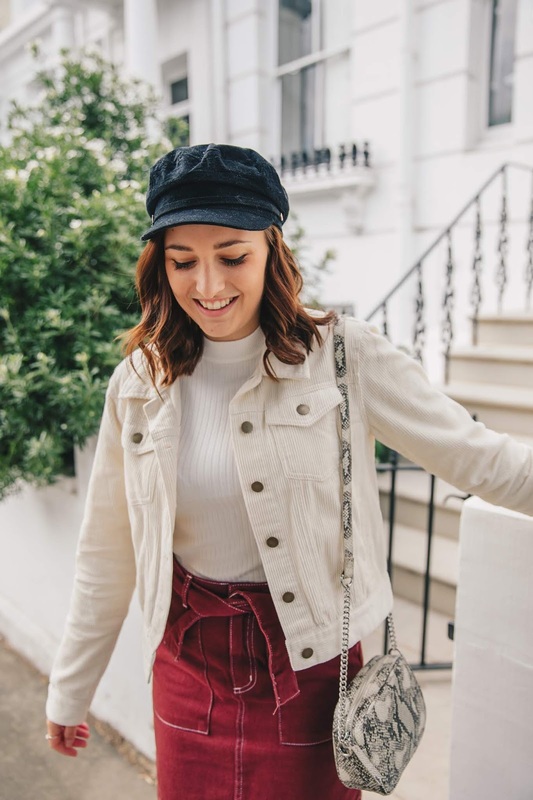 I finished off the look with my favourite black ankle boots, a baker boy cap and a statement print bag. 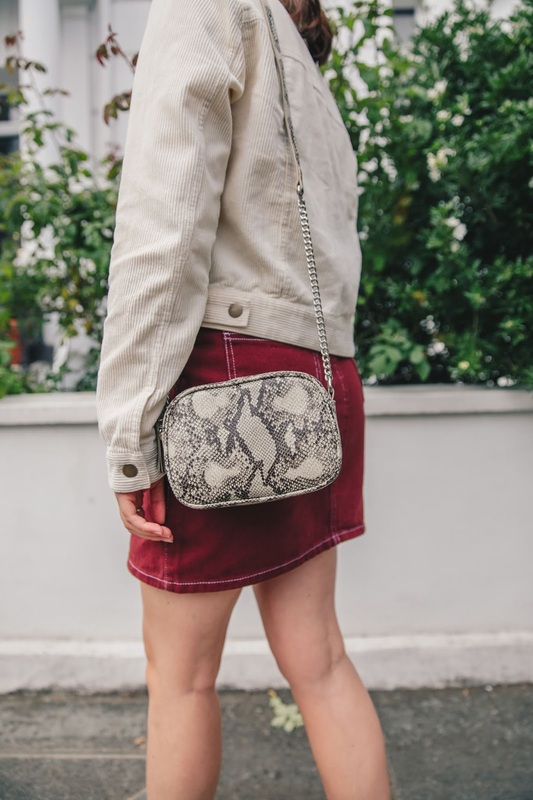 If you feel like the snake skin print is a bit too bold for you to wear in a dress, but still want to incorporate the trend into your wardrobe, this little bag is the perfect piece to buy! It was only £12, a great affordable price for a trend piece. So there you have it. 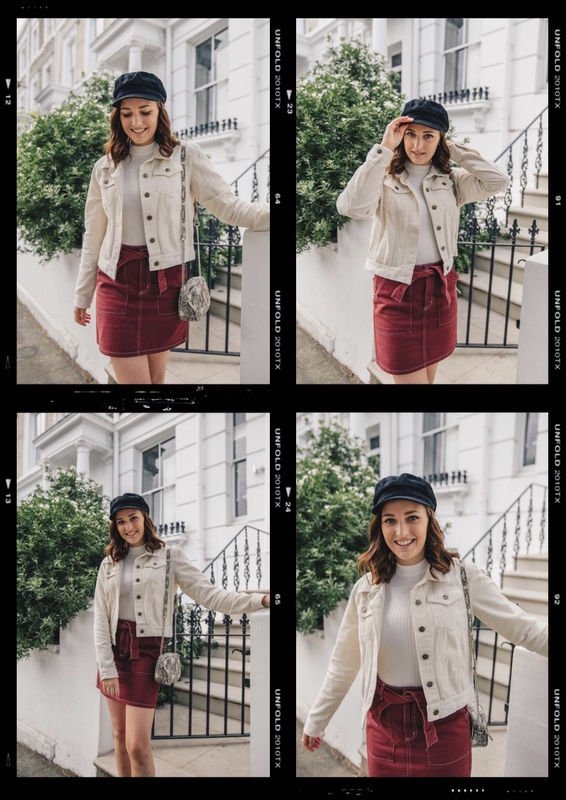 Two outfit's to try this Autumn. Let me know which one you prefer? 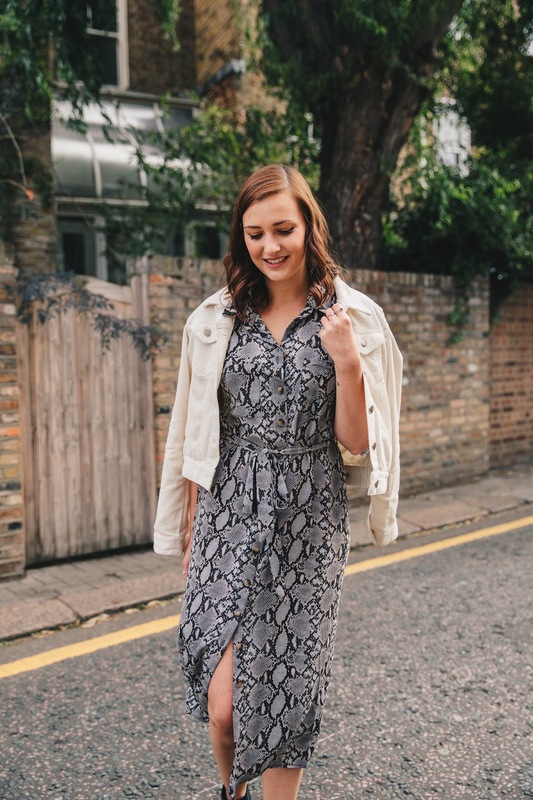 I am excited about sharing more of my outfits over the next few months on my blog and also on Instagram, so make sure you are follow me on Instagram here if you don't already! 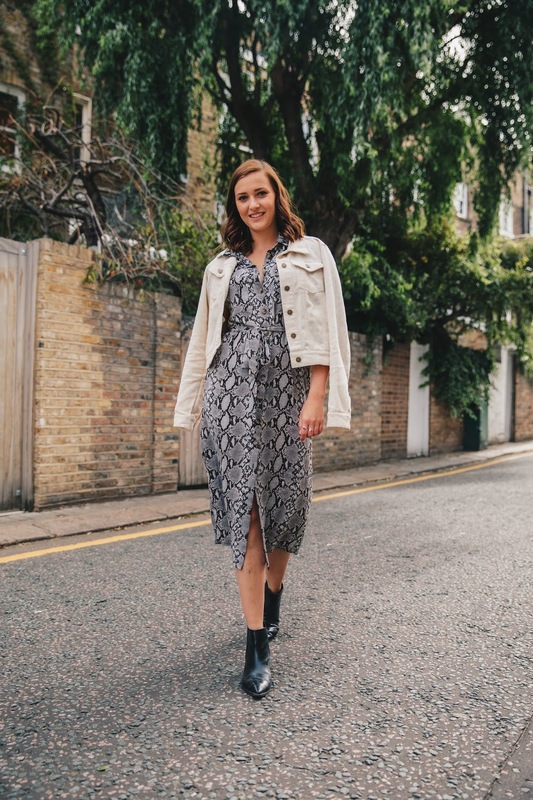 I'm all about the animal print at the moment as well! I can't remember the last thing I bought which wasn't from New Look because their stock is sooooo good at the moment! I absolutely love the skirt!! 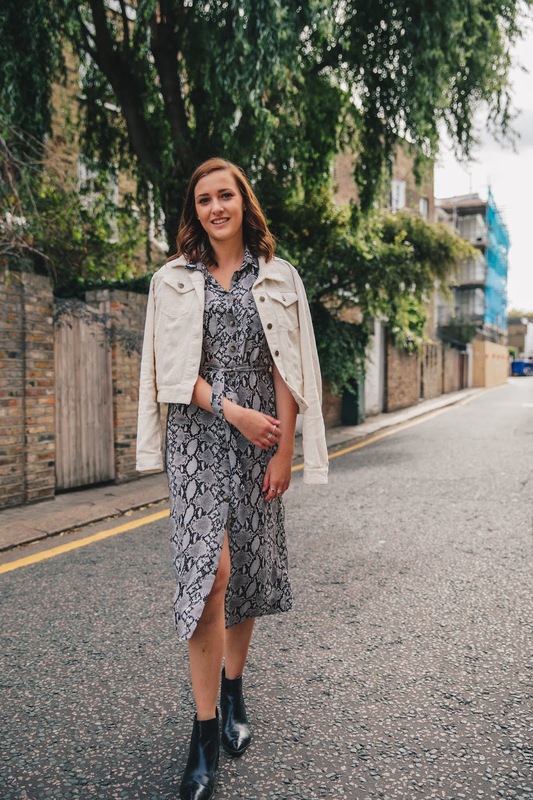 I have a similar one from Topshop which is green, but might have to get the plum one for Autumn. Such a bargain as well!